It's Tuesday and today I have a quick and delicious cran-apple galette. I don't think most people know what a galette is, but it's actually just an open-faced pie. I think it might even be easier than a pie because there's no need to put a pretty crust on top or crimp (I know that bugs some people). Just roll out the dough, put the filling in the center, and fold over the edges. Bake and enjoy. Dorie's pie crust is absolutely amazing- buttery, easy, and delicious. This lime and cranberry combo is new to me but it's really fun and tangy- just make sure you use enough sugar to compensate for the tart, fresh cranberries. Now for the giveaway. I'm sure you've heard about CSN Stores in the blog world before- where you can buy anything from a suitcase to a rice cooker (that's what I just bought from them this weekend- I'll let you know how I like it once it's here!). This time around I have a $75 store credit to CSN Stores (for US or Canada residents only). Just leave a comment and let me know what your favorite type of pie is- I'll leave the giveaway open until Friday at midnight. I love apple pie (so I put extra in this galette of course). Whatever pie you make for thanksgiving, I would try Dorie's amazing dough and her tip to put a little bit of graham or bread crumbs on the bottom to soak up juice- it makes all the difference. I'm having a giveaway, too! Make sure you check it out...you could win a $100 Visa gift card! I am a true southerner in the fact that I am gaga for pecan pie! But I have yet to meet a pie I didn't like! I am not as much of a fruit pie person as I am cream. I love a good french silk pie! i love pecan pie! good tip about the graham- thanks! I have never made galettes before, but u made it sound like it's easier than pie. I am sold! Ur galette looks so refreshingly sweet. I love it! My favorite pie is pumpkin with lots of cool whip on top. I'm an apple pie girl too. Your pie looks yummy Anne! I didn't make this one but I am a HUGE fan of Dorie's crust. It has turned me into a big fan of all pies. Looks lovely! My favorite pie is blueberry pie with streussel topping! Wow your galette looks so pretty. Mmm, this galette looks yummy! I love CSN stores, what a great giveaway. My favorite pie is pumpkin. Mmmm, I can't wait for Thanksgiving. My favorite pie is Pecan Pie with Chocolate Chips. It's my family's fave as well. Whenever I make it for a celebration, I feel like the queen of bakers ... Everyone loves it! If I'm baking, my favorite is apple. If I'm not, my favorite is blueberry. For some reason only my apple is the best, but everyone else can make a decent blueberry pie! Does cheesecake count? Ha ha. I am going to have to go with a Chocolate Cream Pie. I'd like to say I do love a classic apple and peach pie, but if it was next to a chocolate cream pie, yeah...we know where this is going. Yours looks so pretty and delish. I love how easy galette's are. Favorite pie? My grandma's rhubarb pie! I loved how easy this was! Yours looks really good. I like baking with cranberries and they grow them nearby; we've even toured a cranberry farm. My favorite would have to be Lemon Meringue but really any pie will do. mmmmmmm pie. Key lime pie is my favorite but I LOVE all pies,except cow pies. Your Galette looks marvelous! !~ Peacan Pie is my favorite! Pumpkin pie is my favorite (unless you count a cheesecake). Gorgeous galette! We're all on the cranberry bandwagon this week, it seems. Let the cranberries fly! My favorite pie is a marionberry with vanilla bean ice cream on top. I love apple pie if it has enough goo in it lol Oh and a crumb topping is always great! I love the red of your cranberry filling--it's gorgeous. My favourite pie? Apple, all the way. Nestle Toll House pie is my very favorite - what could be better than a chocolate chip cookie crossed with a pie?! I love peach pie in the summertime. I guess apple pie or pumpkin are my favorite. Or maybe pecan. Galette was so easy and so tasty. I would gladly add extra apples to this one. Chess pie is my favorite.Have you ever made one of those? Love Pecan Pie! Your Galette looks yummy. I still need to make it. Apple pie is no doubt my favorite. Thanks for the giveaway! It's tough to pick a favorite pie, but I'll say pumpkin, because it only comes around once a year. Your galette looks great. I don't think I've ever had a cranberry pie before, but I loved this! Now I'm hungry for pie! I like coconut cream pie with fresh coconut! I'd have to go with cherry or apple, but I usually only eat the filling and leave the crust. Is that wrong? Oh...cranberry and lime? That sounds amazing! I love gallettes...I say, but I've never even tried/baked/tasted one! They just look so pretty and rustic to me. Yours looks gorgeous. my favorite pie is apple, heavy on the spice. hands down. i'm having a giveaway as well! come check it out! My favorite is apple pie. But really good apple pie. Fresh apples. Flaky crust. Although I wouldn't turn down any type of pie really! Hmm, is it bad to say I'm not a huge pie fan? I guess I like ice cream type pies best. Because I love ice cream!! Dutch apple!!! Thanks for the giveaway! Such a toss up but I love peach pie so very much and it is a treat to make around the holidays! yes, a galette is a great shortcut to pie! and i am for sure using dorie's crust for my thanksgiving pie...which will be a combo of pumpkin and my favorite pecan! I think I'll have to pick chilled fresh strawberry pie. Yum. My very favorite is lemon meringue. I add the rind of two lemons, this pie really makes you pucker up. Hmmm, cranberry and lime is such a unique combination. 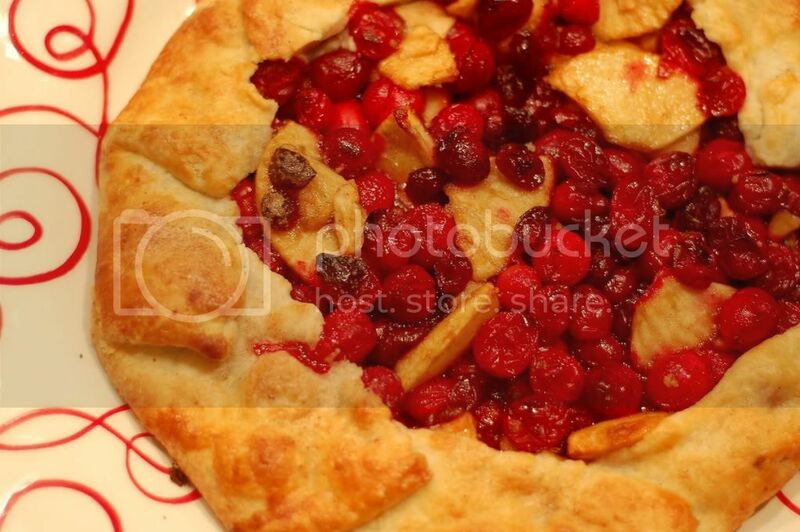 And the galette is such a nice way to present cranberries at the Thanksgiving table.